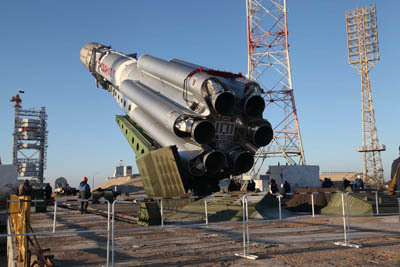 The Russian space industry suffered another malfunction Saturday when the upper stage of the heavy-lift Proton rocket failed to perform the full duration of its final boost-burn, leaving a domestic telecommunications satellite in a lower-than-planned orbit at the end of a 9-hour flight from the Baikonur Cosmodrome. It was supposed to take 9 hours and 15 minutes to reach the ascent's completion, releasing the 9,839-pound satellite into an highly elliptical orbit expected to range from 4,642 miles at perigee to 22,181 miles at apogee and inclined 9 degrees to the equator. The lower three stages that comprised the Proton core vehicle sequentially fired through the initial 10 minutes of flight, leaving the Breeze M upper stage to step through four burns over the next several hours to achieve a preliminary parking orbit before heading into intermediate orbits to hit the geosynchronous transfer orbit. Overseeing the mission was International Launch Services, the commercial marketer of Proton flights. ILS reported that the first three burns by the upper stage and jettison of the donut-shaped auxiliary fuel tank on the Breeze M had been performed, presumably putting the vehicle into a 317-mile by 22,147-mile orbit inclined 48 degrees to the equator within four hours of liftoff. The rocket would then coast away from Earth for nearly five hours until the Breeze M would re-start its engine for a fourth and final burn of the day, raising the orbit's low point from 317 miles to 4,642 miles and bringing the inclination down from 48 degrees to 9 degrees relative to the equator where it ultimately would be stationed. But instead of delivering nearly 9 minutes of propulsion as planned, the burn lasted four minutes short of that, leaving the satellite in the "off-nominal" orbit, according to a statement released by Proton rocket-builder Khrunichev. International Launch Services said a Russian State Commission will be formed to investigate what went wrong and the ILS would set up its own Failure Review Oversight Board to review the commission's final report and corrective action plan. "ILS will work diligently to identify the cause and implement corrective actions. Additional information will be provided as it becomes available," the firm said. Yamal 402 was supposed to maneuver itself into a circular geosynchronous orbit 22,300 miles up and lowering inclination where it can match Earth's rotation and appear parked over the equator at 55 degrees East longitude to begin a 15-year service life. Whether the spacecraft has enough fuel to overcome the rocket problem and still have a sufficient reserve for its 15-year mission life was not immediately known Saturday. Gazprom Space Systems of Moscow planned to operate Yamal 402 in expanding its orbital fleet, using the satellite to relay communications across Russia, the Commonwealth of Independent States, Europe, the Middle East and Africa. This was the 383rd Proton rocket launch since 1965 and the 77th by International Launch Services since 1996, the 8th just this year for ILS and 11th overall by the heavy-lift booster. 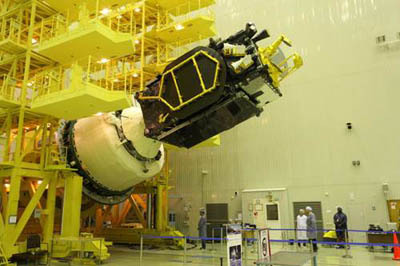 It is the first time ILS has launched a satellite for Gazprom Space Systems and the eighth Thales Alenia Space-built craft to ride aboard the commercial Proton.